Michael Phelps, the most decorated Olympian of all time (22 medals), will travel to Rio looking to create more sporting history. The American swimming sensation retired after London 2012, but made his comeback in 2014. He missed out on the world championships in Kazan after being suspended by USA Swimming, following an arrest for drink driving. But he returned in some style at the 2015 US National Championships, with a superb performance in the 200m butterfly (1:52.94). 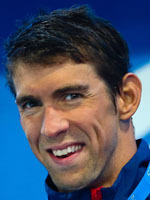 Now aged 31, and with 18 Olympic golds to his name, Phelps is gunning for more glory in Rio. Still coached by Bob Bowman, the "Baltimore Bullet" remains a solitary figure, who is "happy to let his swimming do the talking". His rivals have been warned.